Our commitment to communities extends beyond our stores to include the regions that supply our coffee, tea and cocoa, and other agricultural products. Starbucks invests in programs designed to strengthen economic and social development in local communities, while also caring for the environment. To extend the reach and impact of our programs, we collaborate with nongovernmental organizations that have experience and expertise in working with farming communities. In addition to these collaborative relationships and social development investments, we also support communities through farmer loans, growing our farmer support centers and continuously improving and expanding our ethical sourcing programs, such as C.A.F.E. Practices. In deploying this unique set of strategies, Starbucks is improving the resilience of our supply chain and, ensuring the long-term supply of high-quality coffee and other agricultural goods, as well as building stronger, enduring farming communities. In total, Starbucks has invested more than $70 million in collaborative farmer programs and activities – including C.A.F.E. 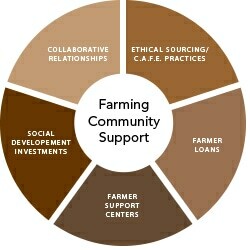 practices, farmer support centers, farmer loans and forest carbon projects. All of these integrated programs directly support improving farmer livelihoods and ensuring a long-term supply of high-quality coffee for the industry. Starbucks invests in programs designed to strengthen local economic and social development. We are working collaboratively with nongovernmental organizations that have experience and expertise in working with farming communities. 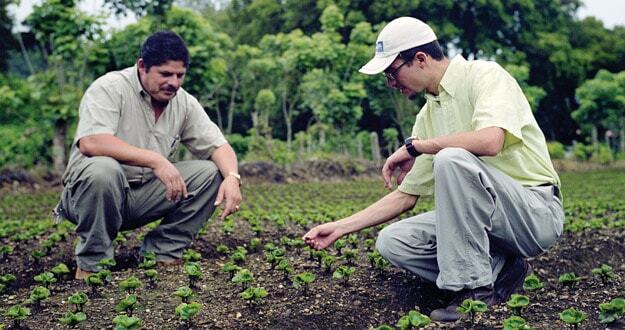 Starbucks has established Farmer Support Centers in key coffee-growing regions to provide local farmers with resources and expertise that can help lower their cost of production, reduce pest and disease, improve coffee quality and increase the yield of premium coffees. The Starbucks Farmer Loans program is an alternative for eligible co-ops that cannot access traditional funding channels. Our ethical sourcing program support model extends beyond coffee to other agricultural product growing communities. Learn more at Ethical Sourcing Overview. Starbucks is committed to helping farming communities endure and thrive. To extend our reach and impact, we work with organizations that have expertise in these agricultural communities. Learn more about our nonprofit partners at Our Relationships.